Boko Haram offensive? Reports say at least 16 villages attacked, 2,000 feared killed. 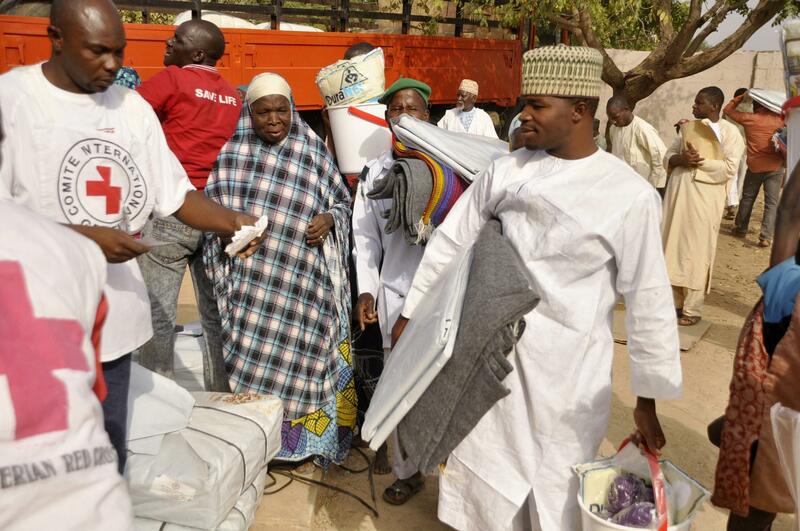 Red Cross workers at a a relief camp in northern Nigeria. Details are sketchy, but two credible outlets—the BBC and Agence France-Presse—are reporting on a massive Boko Haram offensive in northeastern Nigeria that may have killed up to 2,000 people. Nigeria’s militant Islamists have carried out a second attack on the key north-eastern town of Baga, an official has told the BBC. Boko Haram fighters burnt down almost the entire town on Wednesday, after over-running a military base on Saturday, Musa Alhaji Bukar said. Bodies lay strewn on Baga’s streets, amid fears that some 2,000 people had been killed in the raids, he added. Boko Haram launched renewed attacks around a captured town in restive northeast Nigeria this week, razing at least 16 towns and villages, a local government and a union official told AFP. “They burnt to the ground all the 16 towns and villages including Baga, Dorn-Baga, Mile 4, Mile 3, Kauyen Kuros and Bunduram,” said Musa Bukar, head of the Kukawa local government in Borno state. The 200-plus schoolgirls who were kidnapped by the terrorist group last April are still missing, while another 100 women and children were reported kidnapped in December.